Page load time is a metric that tells us part of the story. Yet it might not reflect how fast the visible area loads. For instance, a page with lots of images will report a large page load time, since the load event will be triggered when all of them are fetched, even though the above-the-fold content might load way earlier. It is still a good idea, since it forces us to think about lazy-loading the resources when needed. I have written before about user perceived performance and metrics that tell how long it takes to render something on the page. Using the Paint Timing API we can get the First Paint and First Contentful Paint metrics. In the future I would like to extend the reported metrics to include First Meaningful Paint (whenever it is implemented, see a description of the heuristics here) and Time to Interactive (using GoogleChromeLabs/tti-polyfill). 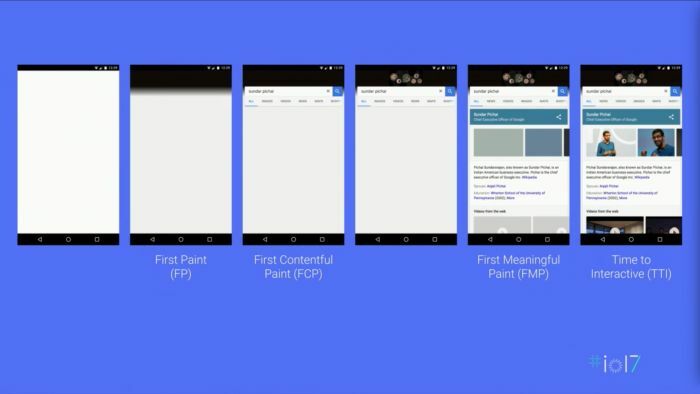 Slide from Web Performance: Leveraging the Metrics that Most Affect User Experience from Google I/O ‘17 showing different key moments during a page load. Leonardo Zizzamia has been working on Perfume.js, a library to measure these metrics, annotate them to the dev tools timeline and optionally reporting them to Google Analytics. It also has a fallback for browsers that do not support the Paint Timing API. You can read more about the library on his posts “First (Contentful) Paint with a touch of Perfume(.js) and “Time to Interactive with RUM“. 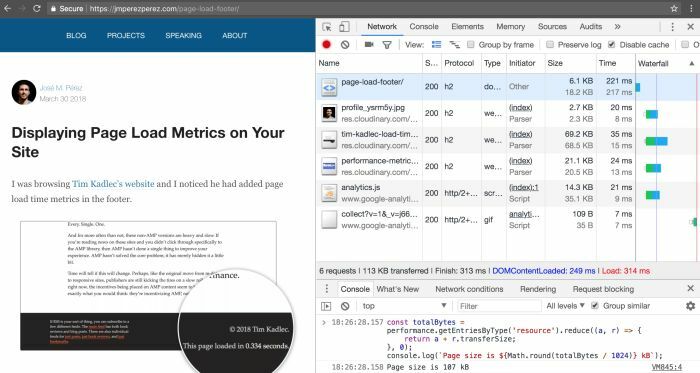 If you are into this topic, I also recommend you to watch the talk Web Performance: Leveraging the Metrics that Most Affect User Experience from Google I/O ‘17. The Resource Timing API allows to know the transfer size of the assets fetched by the page. For CORS requests is necessary to include the timing-allow-origin header set up properly to return the transfer size. Otherwise they will report 0 as the transfer size. Another caveat is that there doesn’t seem to be a way to know the transfer size of the page itself. One could calculate the length of the document’s innerHTML, but that won’t match the transfer size if the response was compressed (which hopefully was). Calculating the transferred size of the request susing Resource Timing API. The reported transferred size according to the dev tools is 113 kB, while the calculated using the code above (Resource Timing API) is 107 kB. Both res.cloudinary.com and www.google-analytics.com set the timing-allow-origin: * response header, which let us get the right transferSize. You can read more about Cloudinary’s usage of Server Timing on their recent post “Inside the Black Box with Server-Timing”. 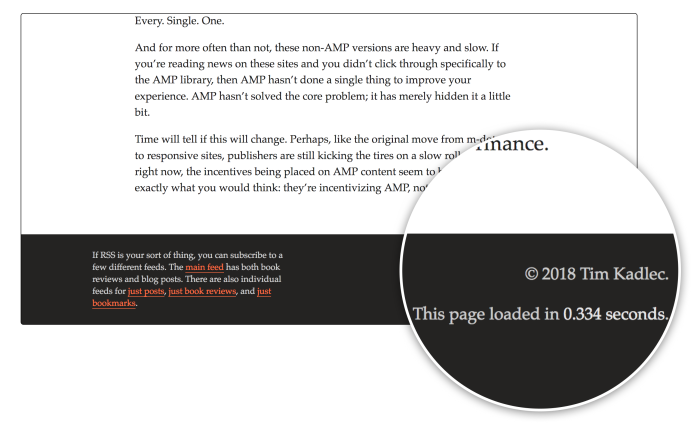 Although we can’t get the exact page load size, using these APIs get us way closer. Displaying these metrics on our sites is a way to communicate publicly that we are taking performance seriously.